The Armenian Gull is called so, because it has its main breeding distribution in Armenian Highland (or Upland). The main website dealing with information on Armenia is www.armeniabirding.info. 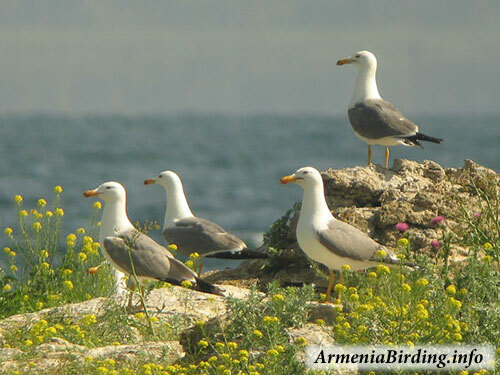 Vasil Ananian (www.armeniabirding.info) explains a bit more about the current situation of Larus armenicus in Armenia. The photo's in this section are from the Armenian site. Vasil: "The estimated number of breeding pairs in Armenia is not exactly known at the moment. They breed at Lake Sevan and Lake Arpi, with the largest population in the Lake Arpi. Maybe there are now about 6.000 - 8.000 pairs in Armenia, but this is VERY rough estimate, as nobody counted them properly in the last period. 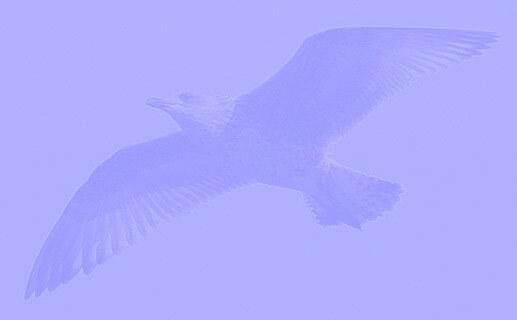 At the moment, there is no field research going on regarding Armenian Gulls in Armenia. Also, there are no ringing projects with Armenian Gulls." Of course, such ringing projects could help to get more insight in numbers, and may shed some light on movements between colonies. It may show if Armenian Gull can be flexible in occupying new territories when circumstances need them to do so. This may be important, as water levels in the Armenian lakes are not constant, and birds breeding on islands may find their colonies in the next breeding season connected to the main land, when water levels drop (see: 1cy Nov Section). Both breeding grounds in Armenia are within National Parks, and the species is on the Red List in Armenia, so special permissions would be required if an institute wishes to execute a ringing initiative on this species. 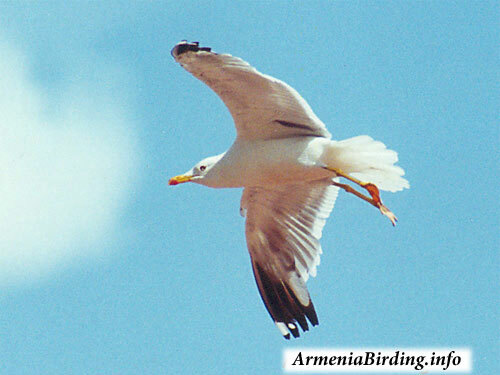 Vasil: "The Armenian Gulls can be seen in Armenia year-round. However, in winter they descend from their breeding grounds down into valleys and gather at fishfarms and rivers. Non-breeding individuals are seen throughout most of the country year-round, and in summer the immature birds frequent the lowlands." Lake/reservoir Arpi Ramsar site (06/07/93, 3,139 ha) is located in Shirak Marz (41o	03'N 043o	37'E) at the altitude of 2,023 m a.s.l. The surface of the reservoir is 2,000 ha, the maximum volume 96 million m3. The catchment of the lake is 22,000 ha. Depending on the year the water-level drop changed from 3 to 5 m. The duration of ice cover period is 4-5 months. Some spring marshes are free of ice during the whole winter. The bottom of the reservoir is silty and boggy. The fauna of wetland vertebrates consists of 8 species of fishes, 3 species of amphibians, 1 species of reptile, around 100 species of birds, and 4 species of mammals. Key areas of waterbird concentration are islets, bogged shores and meandering areas of outlet River Akhuryan, including Amasia Floodplain. Here, one of the colonial breeding species	is Armenian Gull (Larus armenicus) – the colony on 2 islets on Lake Arpi is the largest one in the world numbering up to 10,000 pairs. Lake Sevan Ramsar site (06/07/93, 489,100 ha) is located in Gegharkunik Marz (40o 24'N 045o 17'E) at the altitude of 1,897 m a.s.l. A total of 28 rivers flow into Lake Sevan. The outflow, Rriver Hrazdan, is regulated artificially since 1933. Currently (2005) the surface of the lake is 1,250 km2, the volume 33 km3. Lake Sevan is the greatest lake of the Caucasus Region. The basin of Lake Sevan (4,891 km2) makes up one sixth of the total territory of Armenia. Lake Sevan has a unique combination of large size, high mountain location, and comparatively little mineralised water. 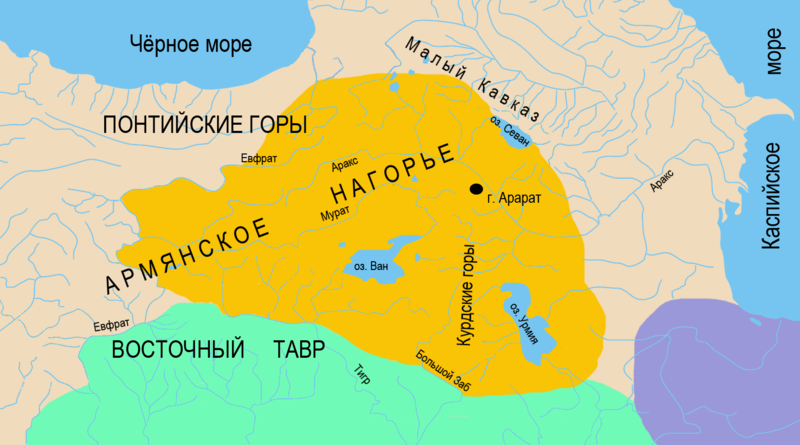 All other great lakes of the region are brackish to saline, notably the Caspian Sea, Lake Van (Turkey), and Lake Orumiyeh (Iran) are saline. In Lake Sevan basin are 6 species of fish, 4 species of amphibians, 18 species of reptiles, 210 species of birds, 36 species of mammals. Key areas of waterbird concentration are islets in Minor Sevan, bogged shores, oxbow lakes of Noratus, Lichk and Gilli, and meandering area of River Argichi (Madina Valley). Here, one of the colonial breeding species is Armenian Gull (Larus armenicus) – the colonies on 3-4 islets in Minor Sevan numbers total 6-8 thousands pairs. Larus armenicus 1cy October 01 2009, Maagan Michael, Israel. Picture: Amir Ben Dov. Juvenile. Larus armenicus 1cy October 15 2010, Maagan Michael, Israel. Picture: Amir Ben Dov. Juvenile. Larus armenicus 1cy October 15 2010, Maagan Michael, Israel. Picture: Amir Ben Dov. Dark juvenile. Larus armenicus 1cy October 07 2011, Ashdod, Israel. Picture: Amir Ben Dov. Larus armenicus 1cy October 01 2011, Ashdod, Israel. Picture: Amir Ben Dov. Larus armenicus 1cy October 01 2011, Ashdod, Israel. Picture: Amir Ben Dov. With heuglini juvenile.